A beautiful coastline distant from the fascinating remains of now land-locked but once powerful Greek cities. 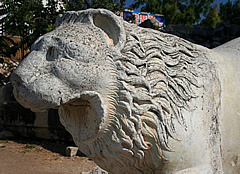 In ancient times Didyma was the site of a sanctuary, possibly of the Anatolian goddess Cybele, about 60 km south of Selçuk. By the seventh century B.C. it was managed by the Branchiae, a family of priests who would interpret the oracle of the temple, an oracle which rivalled the oracle at Delphi in fame and influence. Ionic fluted columns with beautifully decorated bases. 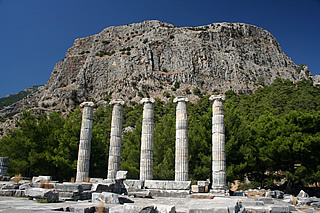 The temple was destroyed by the Persians in 494B.C. 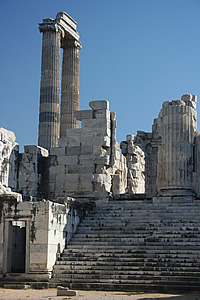 as part of the general punishment meted out to the region for the part Miletus played in the Ionian war. The rebuilding of the temple began in the Hellenistic period, in the third century B.C., but it was never completed. This enormous structure is said to be second only in size and grandeur to the destroyed Hellenistic Temple of Artemis near Ephesus, one of the Seven Wonders of the World. 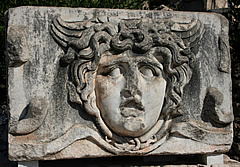 Faragments of the Medusa frieze from the temple exterior. Raised on a platform high above the ground, reached by deep steps, the temple was conceived on a grand scale. The columns, almost 20m high, form a double row around the central area and inner chamber (cella) which was sunk below the level of the platform and reached by tunnels. At the entrance were a further three rows of four columns making 120 columns in all. 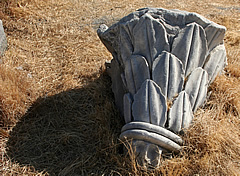 Though columns stand unfinished, or tumbled to the ground, and beautiful sculpture lies scattered in the grass, so much remains that we can easily imagine how imposing the finished temple would have been. 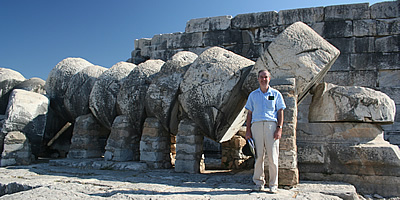 The size of the temple and its massive columns can be guaged by the figure (me!) climbing the steps. One of the tunnel entrances to the cella can be seen bottom left. 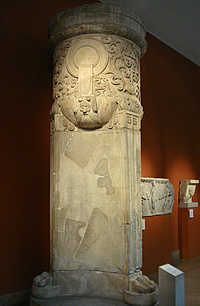 A fallen column reveals the construction technique. 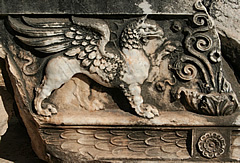 Fragment of griffin frieze	from the cella. Model of Miletus in the Pergamon Museum, Berlin, showing the Lion Harbour, markets and civic buildings as they were around AD200. 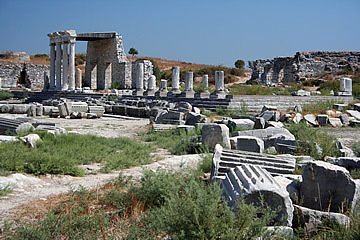 15 to 20km north of Didyma, and originally connected to it by a sacred way, lie the ruins of the city of Miletus. Like Troy and Ephesus, Miletus was for centuries a major trading centre on the sea but came to lie many kilometres inland as the sea receded. It was probably in decline from around 300 A.D. when the harbour began to silt up and Roman power in the area to wane. North end of the Sacred Way, littered with broken columns. It is a large site and it was immensely hot here with little shade. Not a great deal remains standing of this once important harbour city. One of its great claims to fame was as a prolific coloniser - perhaps as many as ninety colonies around the Mediterranean, Sea of Marmara and Black Sea by the seventh century BC. 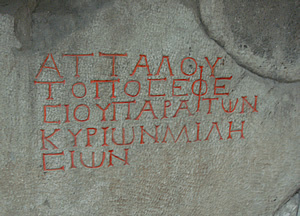 Greek town planning created a regular grid formation of homes but much of the remaining structures are of Roman origin. 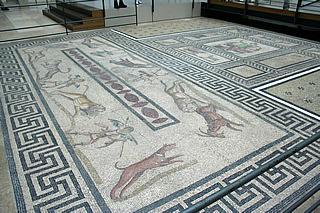 Detail from the Orpheus Mosaic. 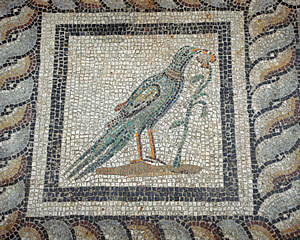 Mosaic floor from the dining room of a Roman private house ca. 200 AD. 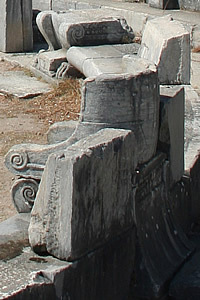 2nd c AD Tripod Monument from the Bouleuterion (Council Chamber) at the south end of the Sacred Way. 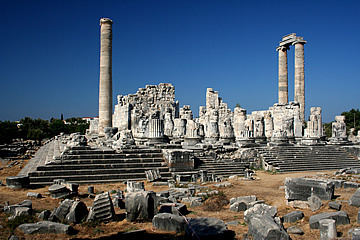 The Sacred Way was a broad road which led from the Lion Harbour to the north entrance of the enormous South Agora, one of two market places in Miletus. 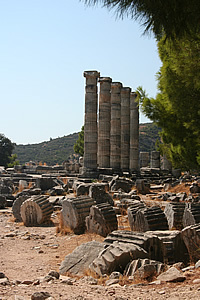 The other, the North Agora, was located at the Lion Harbour and partly on the Sacred Way at that end. 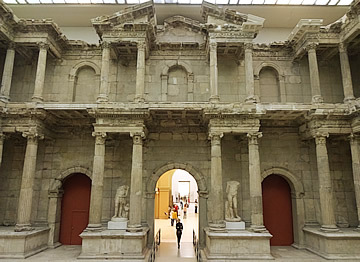 In 2013 and 2018 we visited Berlin and the famous Pergamon Museum where a number of significant artefacts can be found including several pieces from Miletus one of which is the enormous market gate, the north entrance to the South Agora. It dates from the second century AD but collapsed in an earthquake around 800 years later. It was excavated and reconstructed in Berlin but includes significant amounts of modern material. Still, it gives an excellent impression of the monumental architecture of the city. 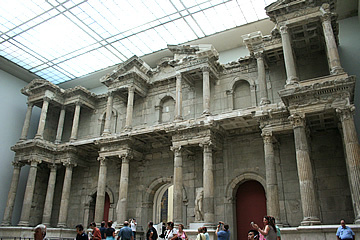 Market Gate in the Pergamon Museum, Berlin. The loveliest and most evocative part are a couple of inscriptions from traders marking their patch. 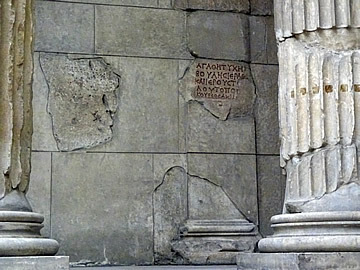 On the side of the Market Gate is this piece of ancient graffiti which declares that this spot is where the Ephesian, Attalos, has his stall. 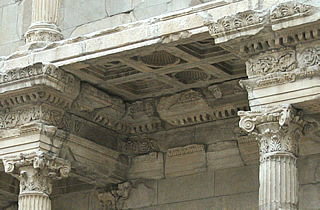 Fluted Corinthian columns and complex coffered ceiling of the Market Gate. The theatre, as seems to be usual in this region, was built by the Greeks and enlarged by the Romans. It is the best preserved of the ruins and still impressive, able to seat 15,000 people. 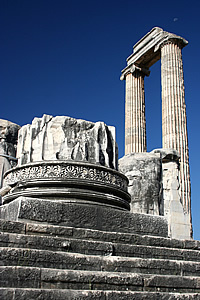 The four columns which held the baldaquin over the emperor's chair are still in place. Originally on the rear facade of the theatre. 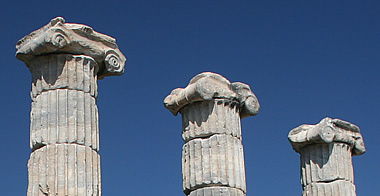 Apollo stands between two torch bearers. All three figures stand on bases and are therefore identified a statues. 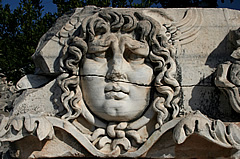 This depiction of Apollo echoes a famous figure from antiquity by the 6th century BC sculptor Kanachos of Sikyon. 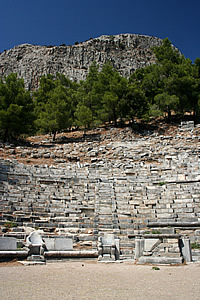 The hill behind the theatre was walled by the Byzantines for use as a citadel. 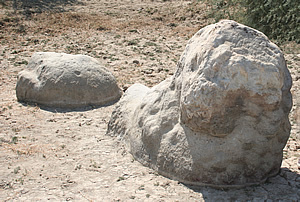 Remains of one of the harbour lions, this head portion is about 130 cm high; its face looks to its right and a thick, curly mane can be made out. It may be in a crouching pose, perhaps ready to pounce. We wanted to try to find the two carved lions which once guarded the Bay of Lions harbour mouth - a chain was strung across the harbour in times of danger. This involved trekking out over flat scrubby ground which would once have been the harbour. With the help of a local we did manage to find one of the lions, sadly very badly weather-worn and fast disappearing from sight. As far as we could see from here, there was no sign of the ocean. The 1st century AD Ionic Stoa, on the east side of the Sacred Way, fronted the Gymnasium. Another city which lost its importance due to silting up of the sea; this had already become a problem in Roman times. 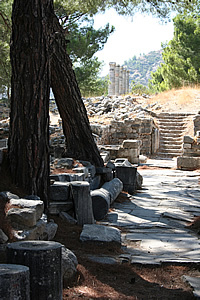 However, much remains of the city built in the fourth century B.C. and, as it was less favoured by the Romans than its important neighbour Miletus, it has less Roman influence in its architecture. Built on the Greek grid system the city rises on a system of terraces below Mount Mykale. This orderly layout can still be clearly seen in the ruins today. High above the plain the city enjoys wonderful views and a cooling breeze. The lower tiers of the little theatre are very well-preserved, including special seats of honour at ground level, the arms and legs of which end in clawed paws. 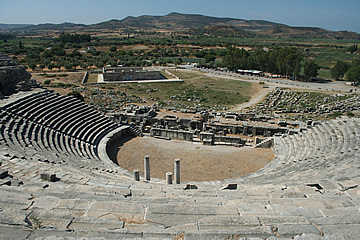 It is one of the best- preserved Hellenistic theatres. One section of stone benches is also supported by clawed paws so maybe they all were - it must have looked very impressive. 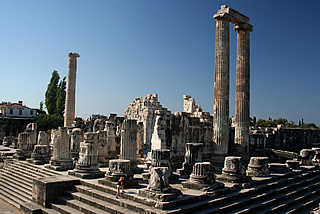 Further on, the extensive layout of the town can be seen from in front of the site of the Temple of Athena, a gift from Alexander and a beautiful example of Ionic architecture - some columns have been restored, the rest lie in shattered heaps on the ground. 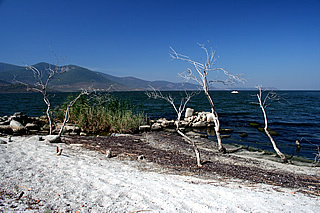 Around 50 km south of Selcuk, on the north east shore of Lake Bafa, lie what remains of Herakleia on the slopes of Mount Latmus. The tranquil lake was once a bay connected to the sea but eventually cut off by the inevitable silting which affected all of this coastline. 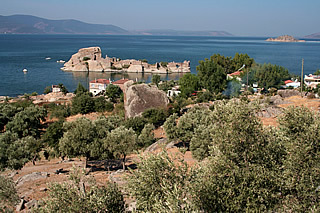 Olive groves cover much of the site - the remains of a Byzantine castle sit on a small island near the lake shore. Although there are some ruins it is the beautiful setting which is the draw. Driving through sunflower and cotton fields to get here, we had sour cherry drinks in the Agora Pension before setting off to explore the area: a Temple of Athena with only the cella walls standing, the Endymion shrine, a ruined necropolis - though we found no graves - and the ruins of a Byzantine castle on an island in the lake. Excellent breads, olives and Efes Pilsen back at the Agora were marred only by the feeling we were being slightly ripped off. Buying figs on the way back to the Katelan for refreshment by the pool, this was one of our more relaxing days! Traveller's Guide: Turkey by Dux Schneider was used on this trip and in preparing this page.